Grab this CUTE story about Earth Day HERE! This 13 page book is designed so that you can copy the book, cut it in half, staple, and then it is ready for use. The 13 pages consist of a title page with the remaining pages including a FUN story about Marcus the Monster, Kate, and Sam. 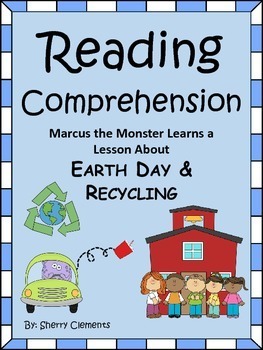 Marcus the Monster learns the importance of recycling as your classroom students will also learn about recycling as they read and answer the questions relating to the story. The final page is a black and white picture of Marcus the monster for students to color. All pages are shown in the preview. The story/questions are on a half sheet of paper. There are many uses for these stories/questions. This can be used in a kindergarten class with the teacher reading the story and questions to the students and having the students use invented spelling to write their answers. They can also be used for independent reading practice in first, second, or third grade by letting students read the short story, read the questions, and answer the questions even if they have to look back in the story to find and write the answer. These short stories are great for guided reading groups, homework, or literacy center activities. I hope your students enjoy this story and questions. Reading Comprehension: Who? What? How?